After hours of surfing food websites and Pintrest, consulting cookbooks and reviewing the Flog, I settled on 3 different hor d’Oeuvres. 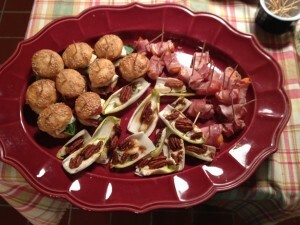 The first was a mini prosciutto, tomato, mozzarella and basil sliders on Jou Jous (from Iggy’s). This is always a crowd favorite and not at all scary to the pickiest of eaters. Next, I took an endive leaf, and filled it with Maytag blue cheese, fig preserves (that I brought back from the Azores) and topped it with a spiced pecan. I also did some with ricotta instead of the blue cheese, as blue cheese can be strong. It’s a perfect bite of salty, creamy, sweet and spicy. Lastly, I wrapped chunks of fuyu persimmon and wrapped them in Niman Ranch ham. It was my own spin on the classic melon wrapped with prosciutto. I was pleased how they turned out – everyone seemed to enjoy them and I even convinced Steve’s teenage cousin to try the persimmon, and watched him return for another. I have been tasked with hor d’Oeuvres for Christmas – back to the drawing board!